An Infinity of Possibilities: BTS' "Save Me"
To the elation of anticipant BTS fans (including myself) over the globe, the night of May 15th saw BigHit Entertainment reveal the stratospheric boy group’s final MV of the three that were promised. Following April 19th’s “Epilogue: Young Forever” and May 1st’s “Fire,” “Save Me” was unveiled in celebration of their special album The Most Beautiful Moment in Life: Young Forever and the end of their chart-busting “youth” trilogy, The Most Beautiful Moment in Life. “Save Me” as a song is quite freshly conceived with its safari-like instrumentals, steeped in electronica, mysteriously emotive lyrics, and stable projection of both the vocal and rap lines. At the same time the song caters to a crisp and contemporary sound and feel, however, it falters in terms of offering musical diversity. 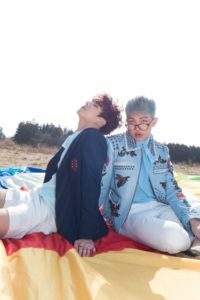 “Fire” (as a song) when compared to “Save Me” was able to prop itself up and project musical depth by making use of its energetic bridge and the many beats and ad-libs that ultimately gave it a fulfilling variance. Meanwhile as a MV, “Save Me” might not exactly be what fans were expecting, given the nature of past BTS music videos (professedly subject to endless theories). But it opens a window in terms of offering fans the chance to formulate their own conclusion, given the “BOY MEETS _” ambiguity following the end of the MV. In other words, its starkness and simplicity translate to a world of possibility, in which fans are the given complete reign and the power to either unearth, bury, re-plant, or sever the flower that began at “I Need U.” “Save Me” is certainly intelligent and while it may flounder in the eyes of those who expected an illustrious ending to such a popular trilogy, its cleanness is vast and creates a special space for imaginations of all sorts to roam and run. The introduction of “Save Me” leads us into a dark and hazy meadow that accelerates towards a figure who is revealed to be a casually clad Jimin; the strokes of a clicking clock are heard as if warning us of a close ending. At the same time, the epic rise and fall of electronic instrumentals is uplifting in its ushering of an even closer beginning. That being said, when looking for meaning in “Save Me” there are specific catchwords communicated by the members of BTS at different stages in the song that really stand out, and contribute to strengthening the potential realism of the lyrics while also enhancing core emotions BTS might be trying to communicate through “Save Me.” The harmonious catchword that embodies Jimin’s role in “Save Me” is in fact – “don’t wanna be lonely, just wanna be yours” in which feelings of forlornness and the desire to be wanted are expressed; one notable tenet of “Save Me” as a whole. Immediately after Jimin has made his wispy and quick declaration, Jungkook makes himself known by lightening the speed of the song with his mature vocals, and sweetens “Save Me” with a drop of dramatic awareness that contains a very intense and anxious romanticism. Amidst the clear rhythm of wooded percussion in the backdrop, the crucial catchword we attach to Jung Kook’s role in “Save Me” is – “it’s dangerous how wrecked I am” in which feelings of emergency and waning self-restrain are expressed as yet another tenet of “Save Me” as a whole. With the bruised clouds as his backcloth and greying wind tousling his bright hair, V is the next member to once again change the direction of “Save Me” and rush in its chorus with a passionate buildup. With a deep timbre and famously raspy voice that evokes a broad connectedness, V signals the chorus of “Save Me” with his catchword – “it calls you whenever it wants to” in which his restless heart yearns without end and embodies a regression to feelings of vulnerability and reflection, completing the third tenet of the story of “Save Me” in its entirety. Intermingling with V’s verse is the beginning and ending of Jin’s; his falsetto is highlighted by a drowsy ease that emits a boyish zeal at the same time it radiates the inner heartache of a very forbearing young man, Jin’s catchword is an embodiment of the main story of “Save Me” because of the way it underlines the disparity between the darkness that obscures ones present self and the brilliance of salvation which lies with the person one wants to be saved by – “you are shining so brightly” he beautifully sings. After a sentimental performance from BTS’ vocal line, the chorus of “Save Me” seeps into the MV while the choreography break is layered into its electronic repetition and intonation by each of the members. The cohesive dancing is skillfully magnified by the one-take filming method which captures the choreography to its full potential and paints BTS in a unified light. “Save Me” in this way seems to be an ideal platform for showing off BTS’ choreography instead of drawing attention to itself musically. The lyrics at times seem repetitive and the lack of range in light of the song’s beat and tempo is a slight letdown; and being quite a short song, acquiring the depth we heard in “Fire” would have done “Save Me” well and given it a more fulfilling and conclusive sound. The first rapper to make his fervent entry into “Save Me” is Suga, who does a satisfying rap with his characteristically bending and rising pitch which is animated by his unique vocal colour. His rap is concise but at the same time comprises a messy and riotous tempo that alludes to feelings of frenzied distress and restlessness that are the fourth tenet of the meaning conveyed by “Save Me” his catchword – “it swallowed me, this lunatic” is the blankness of ones memories that consume oneself beneath the moonlight. The moon is a famous motif of madness and Suga incorporates it into his rap quite ingeniously. J-hope, who often times is buried beneath the rapping feats of Suga and Rap Monster is the rapper who excels the most in not only “Save Me” but also in the other two songs that comprise the Young Forever special album (“Epilogue: Young Forever” and “Fire”). There is a special quality to J-hope’s voice that is so pleasingly dense yet sharp, as if it is the middle ground between the blithe pitch of Suga and the sleek baritone of Rap Monster. His attachment to the trap style is prevalent in the delivery of his opening verse in “Save Me,” and his vocals alternate between a higher pitch and deeper pronunciation to create a compact melody. J-hope’s rap is structured quite well, as important verses in his rap are highlighted and then softened to testify feelings of incontestable dependence and fallibility — “the best of me, I have only you”– elaborating on the fifth tenet of “Save Me” as a whole. Before Rap Monster makes his concluding rap, the final dance break is performed by BTS as they convey emotion by describing how badly they want their outstretched hands to be clasped and salvation placed upon them by the one they love. After the veil of Jungkook’s enigmatic “THISISNEVERTHAT” shirt is lifted from view, leader Rap Monster is seen leading an excitable choreography of his own with J-hope and Jimin complementing him in the back. In “Epilogue: Young Forever” we heard Rap Monster’s lyrics subsuming private feelings about his career, fans, and future with BTS. “Save Me” illustrates a similar poignancy in which he thanks a mysterious muse (perhaps the song’s love interest) for letting him be himself and straightening him out; his catchword is certainly “thank you, for being ‘us’” wherein the ‘us’ pronounces the final message of “Save Me” in its entirety. That is to say, Rap Monster’s catchword embodies feelings of gradual acceptance and the impassability of endings. His vocals in the rap are consistent and quietly irrevocable. The last and most impactful shot we see of “Save Me” is at the very end, when a black screen is interrupted by two words written in capitalized white “BOY MEETS” followed by a cryptic blank. At the end of “Fire,” similar treatment was received by fans when “BOY MEETS WHAT” left them puzzled; in the case of “Save Me” and its “BOY MEETS _” the possibilities are infinite and that is the one and only answer. The question of “BOY MEETS _” is intended to give fans the complete authority to navigate its answer and can take the form of whatever fans want it to, whether it be “BOY MEETS GIRL,” “BOY MEETS REALITY,” or even “BOY MEETS WORLD,” there is no one word that is perfect or correct. The question is one and the potential answers are many, but the ability to select the perfect answer belongs to the imagination of fans and whatever direction they desire to steer BTS’ “BOY MEETS _” in. The conclusion of “Save Me” sees the elaborate instrumentals and dark videography wither away into a still culmination that resembles the withering of a flower, one which blossomed in The Most Beautiful Moment in Life Pt. 1, reached its prime in The Most Beautiful Moment in Life Pt. 2 and eventually met its end in The Most Beautiful Moment in Life: Young Forever. As an A.R.M.Y, coming across a wide array of opinions and wishes for the direction of BTS’ music is inevitable. Some sentiments are crystallized while others are fluid but in the end, all sentiments persist. When I see comments on social media left by fans in which they disparage The Most Beautiful Moment in Life for being too ‘depressing’ and ‘dark’ and wish for a return to BTS’ hip hop era, two thoughts flash through my head. The first being acceptance of the fact that fans are entitled to their own opinions, and the second being personal dissent to such an opinion because of how much I value The Most Beautiful Moment in Life in its totality. Every song in The Most Beautiful Moment in Life came in the form of a single story to me, even a lesson perhaps. That is to say, youth is not only comprised of pleasure, happiness, and triumph. Youth too is sorrow, hopelessness, and failure. These two faces constitute the most beautiful moments in life because they instill in us the realization that we are alive and that we are capable; with the inevitability of this duality we also realize that we want the best for ourselves and that we must keep running forward to accomplish so.